China has warned about the “huge impact” on global trading, if U.S. President Donald Trump proceeds with his plans to impose 25 percent tariffs on imported steel and 10 percent on imported aluminum products. Canada's Prime Minister Justin Trudeau waits to speak at the AppDirect office in San Francisco, Feb. 8, 2018. Trudeau said Friday he is prepared to “defend Canadian industry.” Canada is the United States’ biggest foreign source of both materials. He warned that the tariffs would also hurt U.S. consumers and businesses by driving up prices. The European Union was also stung by Trump’s plan, as evidenced by European Commission President Jean-Claude Juncker’s warning that the EU could respond by taxing quintessentially American-made products, such as bourbon whiskey, blue jeans and Harley-Davidson motorcycles. European Commission President Jean-Claude Juncker addresses a news conference during a European Union leaders informal summit in Brussels, Belgium, Feb. 23, 2018. “But I can’t see how this isn’t part of warlike behavior,” he said. Director General of the World Trade Organization, Roberto Azevedo, speaks during the eleventh Ministerial Opening Conference of the WTO in Buenos Aires, Argentina, Dec. 10, 2017. The currency market responded with a drop in the value of the U.S. dollar against most other major currencies. It ended the day at its lowest level against the yen in two years. The euro gained a half-percent against the dollar Friday. And the Dow Jones Industrial Average finished the trading week with its fourth decline in as many days, ending at 24,538.06. The Nasdaq and S&P 500, however, rose slightly after a three-day losing streak. 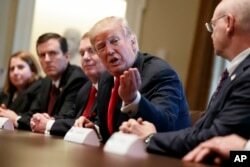 President Donald Trump speaks during a meeting with steel and aluminum executives in the Cabinet Room of the White House, March 1, 2018, in Washington. From left, Beth Ludwig of AK Steel, Roger Newport of AK Steel, John Ferriola of Nucor, Trump, and Dave Burritt of U.S. Steel Corporation. Trump spent Friday defending his threat to impose the tariffs, saying potential trade conflicts can be beneficial to the United States. A Japanese government official told VOA that Tokyo “has explained several times to the U.S. government our concerns,” but declined to comment further on any ongoing discussions with Washington.